Nokia's event may not be taking place until later today but it hardly seems necessary at this point; what looks to be the full spec sheet for the Lumia 1020 has hit the web. As expected, the spec sheet outlines a 41MP camera sensor with a 3x zoom and six-lens camera with Xenon flash. There's also a 1.2MP HD camera on the front, the specs say. Supposedly, we're looking at a 4.5-inch AMOLED screen (which jives with previous speculation) with a resolution of 1280 x 768 - so HD but not full HD - with 2GB of RAM and 32GB of internal memory to play with. Powering it, the spec sheet suggests, is a 1.5GHz dual-core Snapdragon of indeterminate edition, although previous leaks have suggested the Snapdragon 800, a quad-core processor, which seems less likely in the face of this latest spec splurge. The list also posits that the handset will come in yellow, black and white, with a camera grip accessory and a wireless charging cover peripheral to boot. These specs come by way of UnleashThePhones, which seems to have lived up to its name, although we haven't been able to verify the source and none of the information is particularly new so they could just be chancers. 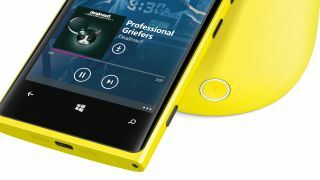 Either way, we'll find out if the Nokia Lumia 1020 is indeed the phone to save Nokia later on today - we'll be live at Nokia's New York event so check back for the news as it breaks.